It's been a little over 5 months since our wedding and i still have my dress. Every time i open the closet where my dress is hanging, i start thinking about what to do with it. Keep it or sell it? 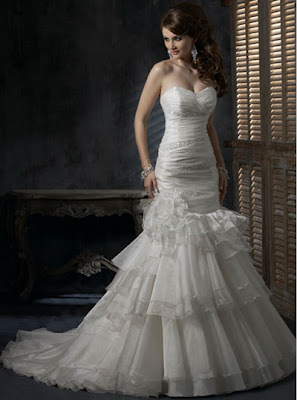 There are mixed reviews on the topic of selling your wedding dress. Some people opt to keep theirs for various reasons and others would rather do the opposite. I have been reading a little about wedding dress preservation, ideas on transforming your dress into something wearable, selling vs not selling and selling price for second hand wedding dress. With all these options available, I'm not sure which route i want to go with mine. Some people feel like you should never sell or think about selling your wedding dress just for the fact that it is THE DRESS that you wore when you married the man of your dreams. So, you should keep it forever and maybe try it on once in a while when you feel like it, if the dress still fits of course, if not then just look at it. Other reasons for not selling includes keeping it for memories or keeping it for your children. Either for them to wear on their day or to make garments for them. You can also keep it to make something more wearable for yourself. 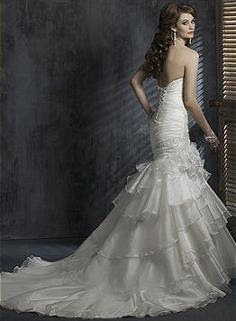 But, there's the other side who thinks your wedding dress did not make the wedding, but it's the man and memories you created that made the wedding. Which i totally agree with. By selling you are also giving someone else who can't afford to pay the original price the chance to wear their dream dress. You also have pictures and video tapes of your special day, so if you need to remind yourself of what it looks like you have those to look at. I don't think i need pictures or videos to remember mine, because the image of my dress is plastered in my head. Talking about pictures and videos from the wedding, we still haven't received our copies from the vendors, that's a story for another day. I am emotionally attached to my dress but i don't need to have it hanging in my closet for those emotions to remain the same. I think i know which side I'm leaning towards but I'm not sure yet, i want to make sure that whatever i do with it, i don't regret it in the future. What do you guys think? Here's a picture of my dress (Destiny). Would have loved to share a picture of myself in the dress, but sadly I'm still waiting on that. And I'm still in love with it! "A wedding is wonderful, but it's the marriage that matters at the end of the day."